These days, North Carolina isn’t exactly the holy land of civil liberties. It won’t let you go to the bathroom that fits your gender identity without fear of punishment. It’ll tackle and arrest you for speaking up at university board meetings. Why, then, would it suddenly be concerned about protecting freedom of speech? In this post, students from four schools lay out why they’re organizing, the forces that have tried to silence them, and how they’ve maintained their campaigns. This post is the latest edition of The Nation’s student and youth organizing feature, edited by James Cersonsky (@cersonsky). For more, check out February 18 and March 11. That’s what Lieutenant Governor Dan Forest’s “Campus Free Expression Act” is supposed to do. Under the act, Forest says that he wants to make the University of North Carolina system “a place where there is free trade in the marketplace of ideas”—that is, where “all students, faculty, and others in the University community have the freedom to express opinions on the issues of the day.” His motivations seem more complicated, however. If the act moves forward, universities won’t be able to take action on issues brought up by students, such as divestment measures, out of concern for the “suppression of other viewpoints.” In addition, students could face expulsion for disrupting public events—putting the plug on ongoing protests at Board of Governors meetings against the corporate takeover of the UNC system, the dismantling of the state’s historically black colleges and universities, and the appointment of Margaret Spellings, George W. Bush’s secretary of education, as UNC president. Forest’s double-talk can be seen, in fact, as the end of “free expression” as students know it. Theoretically, as long as schools are meant to serve them, those in charge should be interested in listening to what students have to say. At UNC—or up the road at Duke, where administrators have threatened students for demanding racial justice—this isn’t necessarily the most convenient way of doing business. The alternative? Preventing conflict in the first place. At What Point Do Black Lives Stop Mattering to Administrators? In March 2015, Eradicate #BostonCollegeRacism emerged from the heartbreak and anger surrounding highly visible murders of black men and women by law enforcement. Week after week, violent images of disregard for black bodies pervaded the media—yet leadership at a university with a public mission to be “one for others” was silent. When students tried to speak out by staging a “die-in,” BC chose to discipline us. In response, three student researchers created an infographic that pointed out the contradictions between BC’s stated social-justice mission and its actions to silence student voices. As the infographic gained visibility, a number of student activists started experiencing some of the same silencing that it documented, and the Eradicate movement was born. First, we were called into a string of meetings with administrators. We were told that the infographic was not approved for posting on campus and that we should refrain from taking further actions because of “concern for our student standings.” Later, a second infographic was denied by the provost’s office, abridging both established posting rules and common standards of academic freedom. Since then, EBCR has hosted numerous events meant to amplify the voices of silenced students and push the university to address student concerns openly and transparently as many other universities have done. 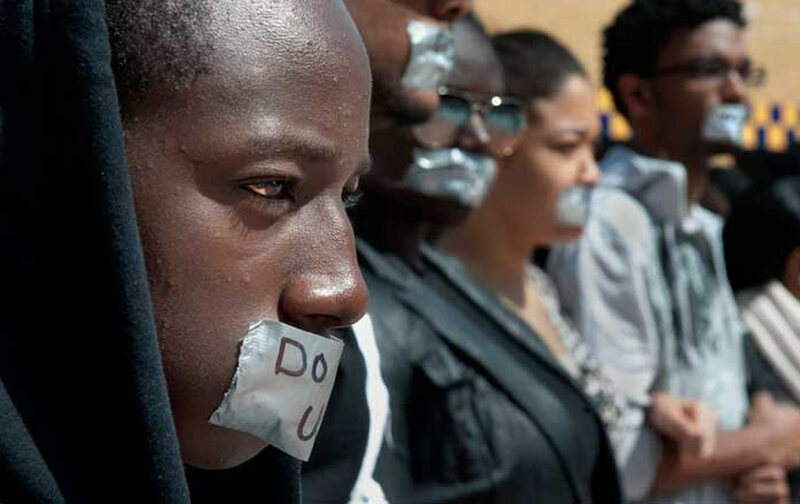 At last May’s graduation ceremony, a plane commissioned by an anonymous EBCR supporter flew over trailing a banner that read, “Eradicate Boston College Racism.” In October, BC invited Ta-Nehisi Coates to speak, and dozens of students wore duct tape over their mouths to signify the silencing of student voices on campus. In December, we staged 12 straight days of action that included the singing of anti-racist Christmas-carol parodies outside a Board of Directors meeting. There, the silencing continued: Students were not allowed to deliver our proposals to board members, and several student leaders were later called into official-conduct meetings. Most recently, in February, elected leaders from the undergraduate student government organized a town-hall meeting to unveil a proposal addressing issues of diversity and inclusion at BC. This proposal was the painstaking, collaborative effort of many campus groups, including EBCR. Student leaders had presented the proposal to university administrators months before, with some circulating almost a year ago. Though the meeting drew a standing-room-only crowd to one of BC’s largest venues, no official response was offered from the president or any other high-level administrator. When administrators engage with students, they’re more likely to invite us to talk with them one-on-one, behind closed doors, demonstrating the lack of priority given to issues of racial oppression and an unwillingness to take comprehensive action. For decades, anti-racist groups have grown tired of evasive tactics from a nearly all-white administration more concerned with PR than with students, faculty, and staff of color. Until BC lives up to its mission to be an institution that prepares students to “set the world aflame” with social justice, we will not be silenced. On March 17, the University of California Board of Regents rejected the Final Report of the Regents Working Group on Principles Against Intolerance, recognizing that anti-Zionism is legitimate as long as it isn’t anti-Semitic. The demand for this report came from outside entities who have pressured the UC administration to censor speech critical of Israel state policies. These actors aim to shut down Students for Justice in Palestine and Jewish Voice for Peace, ultimately chilling the movement to boycott, divest, and sanction the state of Israel at the UC level. The problem with the report was clear: It conflated anti-Semitism, or bigotry against Jewish people and culture, with anti-Zionism, a political movement and ideology. The working group had adopted the controversial US state definition of anti-Semitism, which states that any demonization, delegitimization, or double standard applied to the state of Israel is “anti-Semitism.” Not only is this, itself, a double standard but it also fails to adopt broader histories of Zionism and targets vaguely defined terms in a way that would risk violating academic principles of freedom of speech—altogether reflecting a level of anti-intellectualism that has no space at a university. While fighting the report, we faced attempts at censorship from all sides. UC Regent Richard Blum and his spouse, Senator Dianne Feinstein, threatened formal punishment to students and faculty expressing anti-Zionist views, up to and including permanent expulsion. At demonstrations, we’ve faced Islamaphobic hate speech, racialized slurs, and even physical assault. At the Regents meeting on March 23, SJP, JVP, and individual faculty stormed the UC Office of the President to protest enactment of the statement. We also voiced complete lack of confidence in the Regents’ choice of “experts” for the report: two off-campus partisans of Israeli advocacy groups, a faculty member who admitted not to be an expert on the term “Zionism,” and another faculty member involved in reducing the number of black, Latinx, and Native enrollment at the UC as a legal architect of the atrocious Proposition 209. Most importantly, we engaged a broad cross-section of organizations to endorse our position, including unions, legal groups, the UC Academic Senate, and even the Los Angeles Times. This victory over censorship, and the larger fight to get the UC to stop fueling the Israeli government’s five-decade long military occupation, is driven by growing solidarity for human rights across struggles. Anti-LGBT hate slurs hang in the halls of Franklin County High School in Winchester, Tennessee, like songs on a broken record. In January, a group of students responded by starting a Gay-Straight Alliance at the school, to fight the hate and prejudice against us and our straight allies. Within the first week of our first meeting, people were questioning why we needed the GSA in the first place. Community members started a Facebook group calling for “protection for traditional marriage.” On February 8, the school board held a hearing on whether we had the right to meet. Attendees raised Christian flags and whispered hateful slurs under their breath. The first speaker argued that clubs that promoted any type of viewpoint shouldn’t be allowed, whether they’re Christian or LGBT. The second speaker revealed that the entire reason we started the club was to have a cover to perform sexual acts on one another. The opposition was strong, but we were stronger. After students spoke, and supporters from across the state rallied outside, the board decided that our club could stay. After the hearing, students at the high school began putting up “straight pride” posters. One of my teachers told me, “I don’t like the rainbow flag. I like the American flag.” One day, my girlfriend and I were putting up GSA posters in the lunchroom. We had one of our posters ripped down, and we almost got attacked by a group of males. When we reported this to an administrator, he suggested that we were the instigators for hanging posters during lunch. After that day, we have been too afraid to go in the lunchroom anymore. Meanwhile, I was told to kill myself, but the administration did little to nothing about it. Our school had become a circus. Administrators were the ringleaders, the other students were the performers, and we were the freaks. It had been one month since the first school-board meeting, and we were already back again. They considered getting rid of every non-academic club in Franklin County just to get rid of us. After a long, heated debate, they again voted to allow us to stay. We still have a ways to go. In March, we were told that our buttons are a violation of dress code, despite that students can wear cross necklaces and staff can wear hats with Confederate flags. Our shirts were denied for having “too much color,” even though the band shirts last year had a rainbow font and were printed on yellow T-shirts. The administration uses the excuse that band students “aren’t allowed to wear them anymore,” despite that they wear them all the time without questions. As much hate and discrimination that our club goes through, the loving support of the GSA members is what keeps us going. Hiking Fares, Cutting Funding, and… Knocking on Your Door About It? Imagine that you were harassed by police at the bidding of a corrupt CEO. This executive influenced the police to intimidate students, workers, and community members in retaliation for protesting—exercising their right to express anger after cuts to worker pensions, higher prices for customers, and a hike to the CEO’s pay. Imagine that his salary is funded by taxpayers in a small city, but that he makes as much as the head of NASA. In 2016, this is Grand Rapids, Michigan, as students and workers organize against Peter Varga, the CEO of the The Rapid, Grand Rapids’ local transit authority. In August, students from United Students Against Sweatshops Local 77 and members of the Amalgamated Transit Union teamed up with community members to put The Rapid in reverse. That month, the board of directors, who are mostly elected officials in Western Michigan, voted to raise fares by 16 percent, gut the defined benefit pension of the workers, and give the CEO a raise. Since August, the ATU tried bargaining with the company, but Rapid executives refused to sit in the same room as ATU negotiators. Varga refused to respond to simple requests, and, even the mayor, a professed fan of Cesar Chavez who sits on The Rapid’s Board of Directors, refused to listen. In response, we’ve taken up civil disobedience. After students, workers, and community members held a sit-in at a city commission meeting in November and shut it down, the mayor issued a public statement condemning our action. Soon after, the Rapid called USAS’s faculty adviser to try to get us to stop working with the ATU and told us that we were “just going through a phase.” At the Rapid’s January board meeting, we held another sit-in. This time, a worker was suspended indefinitely—prompting a federal ruling two weeks later affirming workers’ right to protest at board meetings. Meanwhile, Rapid executives admitted that they were trying to convince the city to pursue and prosecute students. Indeed, on March 18, a plainclothes police officer showed up at the door of a student organizer, told her that she was going to be charged with a civil disturbance, and asked her to identify other group members. She also said that students would be arrested in their homes if they didn’t show up to the police station to pick up a summons. Soon after, two others students were approached, including one USAS member who didn’t participate in the sit-in at all. Police also came to a worker’s home in body armor and began to question him. After the press began to cover the police harassment, the Rapid publicly admitted to being behind this intimidation campaign—clearly reflecting its commitment to chilling the speech of activists. The Rapid’s plan can only backfire: The ATU, USAS, and the Grand Rapids community are more determined than ever to see this struggle through. In the face of corruption, we see how much harder we need to organize to win.